SF State Gators' Iris Tolenada (10) and her fellow teammates were introduced prior to the game against Cal State East Bay at The Swamp in San Francisco Friday, Sept. 14, 2012. The Gators won 3-0 against Cal State East Bay. SF State is 6-2 overall this season. Photo by Godofredo Vasquez. 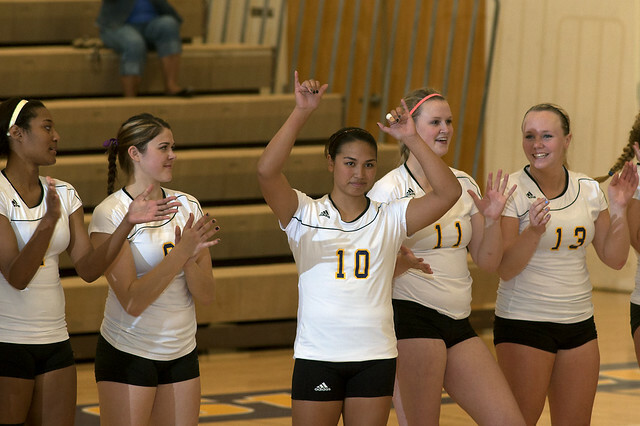 Conference play opened last night for the women’s volleyball team as they took on Cal State East Bay and won another tough match against their division rivals. The Gators managed to sweep the Pioneers in three sets and started off with a winning record of 1-0 for the season. Coming into this week’s conference action, the Gators and Pioneers were both 5-2 looking to improve. The first set was a close battle with East Bay with the Gators leading early on. Both teams kept missing a lot of serves, giving each other multiple chances to score. The Gators capitalized on some mistakes to equal the Pioneers, but eventually edged them out 25-22. The second set looked almost identical as the first set as the Gators cleaned up their game. Serving was one of the key factors in last night’s game as both teams tried to fix their issues to boost their team’s momentum. The Gators once again had enough power to close out the second set and leave the Pioneers trailing two sets. Senior Iris Tolenada finished with a strong performance of 32 assists. Senior Megan Johnson and freshman Meagan Wright both completed 11 kills. Freshman Jaclyn Clark had a season high of four aces as she improved to 12 for the season. Johnson credits the team’s ability to keep the pressure on and never losing focus, ultimately securing the win. Freshman Jaclyn Clark believes today’s big win was a large group effort; everyone played a role. The Gators finished with 44 kills, 40 assists and eight aces. The Pioneers ended with 24 kills, 23 assists and only two aces. Both teams hit double-digit serving errors with SF State committing 12 errors and East Bay committing 13. Head coach Michelle Patton takes this win as a nice beginning but isn’t dwelling on it too much. For now the game plan is simple: just get ready for another great team. The Gators increased their record to 6-2 and are undefeated as the season opens. They will face Cal State Monterey Bay tomorrow evening at “The Swamp.” The Otters are another strong opponent coming in with the same record, 6-2. The game will begin at 7 p.m.